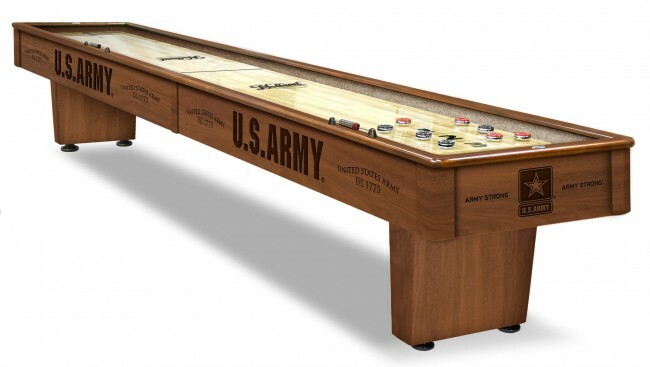 Holland Gameroom is proud to offer this professional quality, Officially Licensed Shuffleboard table. Our finished cabinet features beautiful, laser engraved logo art elements. The cabinet finish is second to none and incorporates a 14-step stain and lacquer process to ensure the high quality, furniture like finish you would expect from a table of this caliber. The 16” wide, 2 ½” thick play surface, is topped with a ¼” thick, poured polymer resin top, that offers extreme durability and exceptional play. On the underside, 5 climatic adjusters allow for consistent play year-round. The cradle is supported by heavy gauge steel support brackets that lock the two halves securely in place. The commercial grade legs include leveling feet so even if your floor isn’t level your shuffleboard table will be. For scoring, the table has two metal, not cheap plastic like most, abacus scoring units, one on each side, or you can purchase the optional electronic overhead scoring unit to really up your game! Finally, the pre-installed Play N’ Stor Hidden Drawer folds up under the game, keeping your pucks, Cleaner, Polish, and Wax stored conveniently and out of the way. There is even room for the optional bowling game. If you are in the market for a high quality, Officially Licensed Logo Shuffleboard Table, look no further than this one from Holland Gameroom!